The following is the first part of the introduction to James Cowan’s book “From Glasgow’s Treasure Chest”. “During the course of busy office life, the disturbing thought had frequently occurred to me, that time was slipping away in a daily round which, though no doubt useful enough as contribution to the welfare of the community at large, and to myself and family as a means of livelihood, was nevertheless somewhat uneventful, and lacking in the qualities necessary to give it any special distinction as a man’s life – work. At first there seemed to be no way of altering this ; but on further consideration an idea began to take shape, which promised to help matters. For some time, I had been taking note of, and writing paragraphs about, things of interest in and around the city of Glasgow, which were usually overlooked by the majority of citizens, though they could have been seen by them just as easily as me ; but most people did not either have the time, or did not care to take the trouble to realise the interest or even in some cases the beauty of these things. The possibility of extending my activities in this way had occasionally crossed my mind ; but supposed lack of time had always been a deterrent. In due course however, I began to realise that full use was not being made of such time as there actually was at my own disposal while in the city. This consisted of the daily break for lunch, extending at most to about an hour and a half. My feeling was that something better could be done with this time than to fritter it away sitting in a tearoom or restaurant. Last edited by Socceroo on Fri Sep 30, 2005 10:47 pm, edited 1 time in total. Has anyone else read From Glasgow's Treasure Chest by James Cowan? Fascinating book. I am currently reading through it. He has already prowled around many of the Projects in Glasgow (in the 1930's) as now featured on the Hidden Glasgow site. It would be interesting to retrace his footsteps some 70 years later and look at the changes, or should i say look to see if anything still exists from his "Project" articles published in the book. Does the book tell you where there is any Rats? If anyone is interested in obtaining James Cowan's book "From Glasgow's Treasure Chest" there is ONE copy available at http://www.grian.co.uk - The Glasgow and Lanarkshire page - Antiquarian and out-of-print books costs twenty quid. James Cowan was the first Urban Prowler who heavily influenced people like Jack House etc. If you are into HG then this book is it. Urban Prowler. Wonder how that would go down on a business card? Or, as a name for a web site? I dunno, you would pobably get 6 - 10 with time off for good behaviour if you used the name Urban Prowler. Though saying that James Cowan used the name "Peter Prowler" for his articles. Apologies for the mistake on the previous posting and thanks to Apollo for pointing it out. You should just be able to make out James Cowan's signature. He etched it on the glass of his old home in Mount Florida. 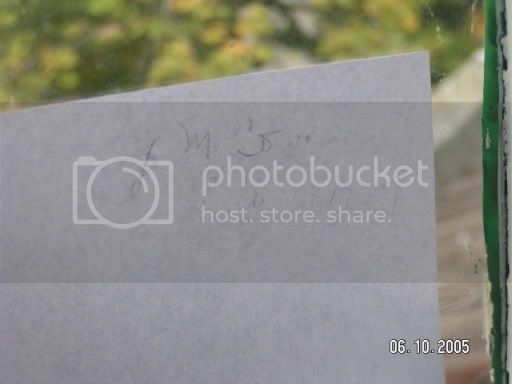 It says "J M Cowan 12th August 1889"
I could not get a good photo so i put white paper over it. This is scary. James Cowan has a stalker! Eh, stalker? no. My interest is that i unknowingly bought his house. Imagine my surprise when during reading his book in the bay widow of my flat one night, that i discovered that the flat he was writing about was mine. I then discovered the glass with his name etched on it one day by accident, although my neighbours had apparently heard about it. Stalker? Wish i had the time. What about you. Cemeteries, graves, night time, tomb stones.................need i go on. I walked into Caledonia Books at Kelvinbridge an hour ago to browse the Glasgow shelf as I do from time to time and there was a copy of From Glasgow's Treasure Chest sitting there - couldn't quite believe my eyes! On closer examination, it turned out to be one of a number of Glasgow-related books that they've acquired from the library of the late Rikki Fulton. A quick swipe of the Visa later, and it'll be sitting on the Glasgow shelf in Armadillo Towers tonight. Nice one. The book is as rare as hen's teeth. You'll enjoy reading it particularly when you note the amount of HG topics that he has already covered in the 1930's. Managed to get a hold of a copy of the book a couple of months ago, and a quality read it is too. Here's a picture of the wee hidden cottage in West Nile Street he talks about in one of the chapters. Armadillo wrote: I walked into Caledonia Books at Kelvinbridge an hour ago to browse the Glasgow shelf as I do from time to time and there was a copy of From Glasgow's Treasure Chest sitting there - couldn't quite believe my eyes! On closer examination, it turned out to be one of a number of Glasgow-related books that they've acquired from the library of the late Rikki Fulton. A quick swipe of the Visa later, and it'll be sitting on the Glasgow shelf in Armadillo Towers tonight. I see there are a number of copies available on Abebooks, the antiquarian books website, but the prices range from £34 to £58. Am sorely tempted though. Would love to have one.